A celebratory dip for the bride and groom after their church wedding at St. Maria Goretti. 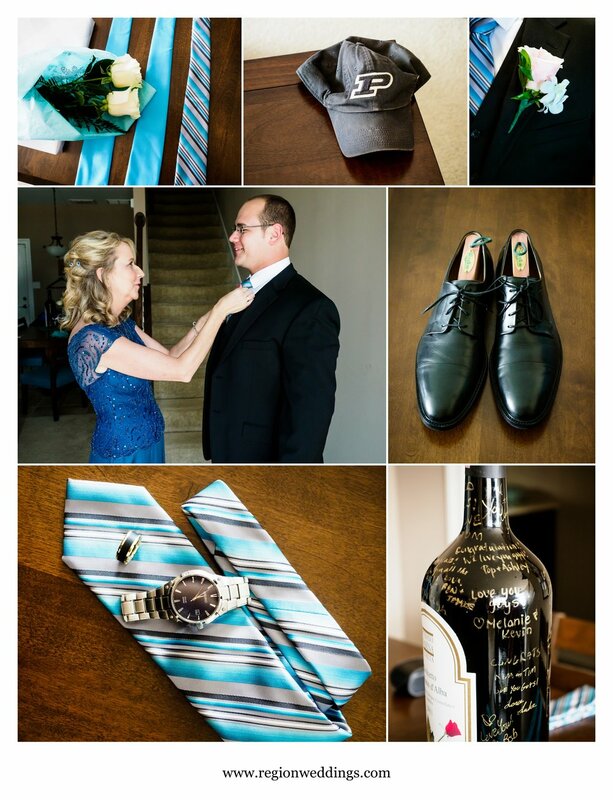 Wow - I had a lot of fun capturing Kim and Tim's summer wedding at St. Maria Goretti Church with photos afterward at Centennial Park and the reception at Halls of St. George. From the welcoming hospitality of each of their families to the "singing bridesmaids", it was an inspirational day for sure. We started the day with myself capturing bridal prep and Bridget with the guys. Wedding day bridal prep for Kim and her bridesmaids. Getting ready at the bride's parent's home. Groom prep for a church wedding at St. Maria Goretti. Bride and groom dressed and ready for their summer wedding. 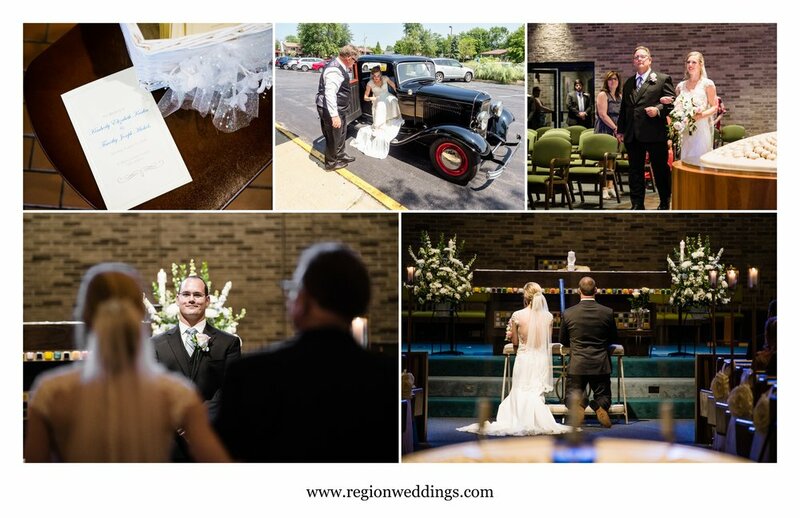 Kim's Dad escorted her to the church in his vintage car and in his arms down the aisle of St. Maria Goretti Church in Dyer, Indiana as Tim looked on. The bride and her father at a catholic wedding ceremony at St. Maria Goretti Church. 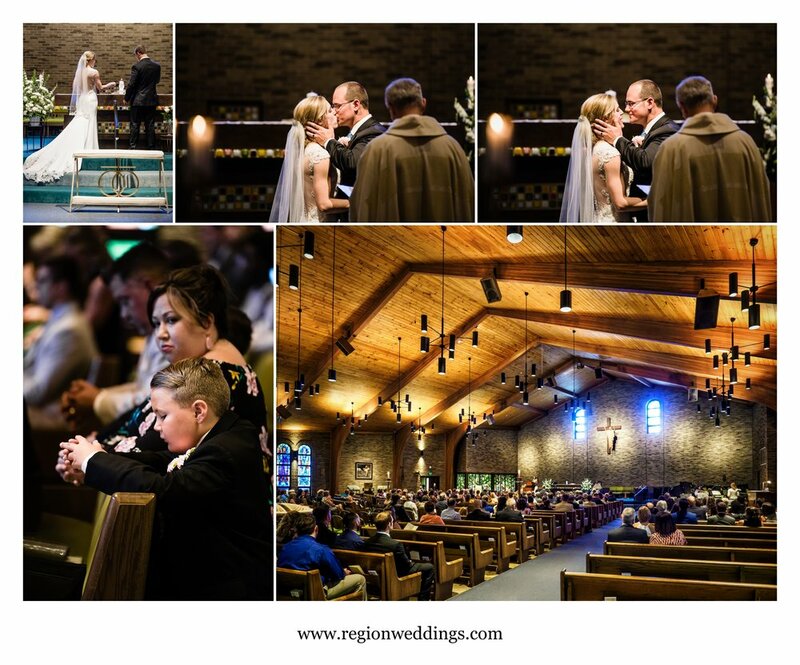 Wedding ceremony at St. Maria Goretti Church in Dyer, Indiana. 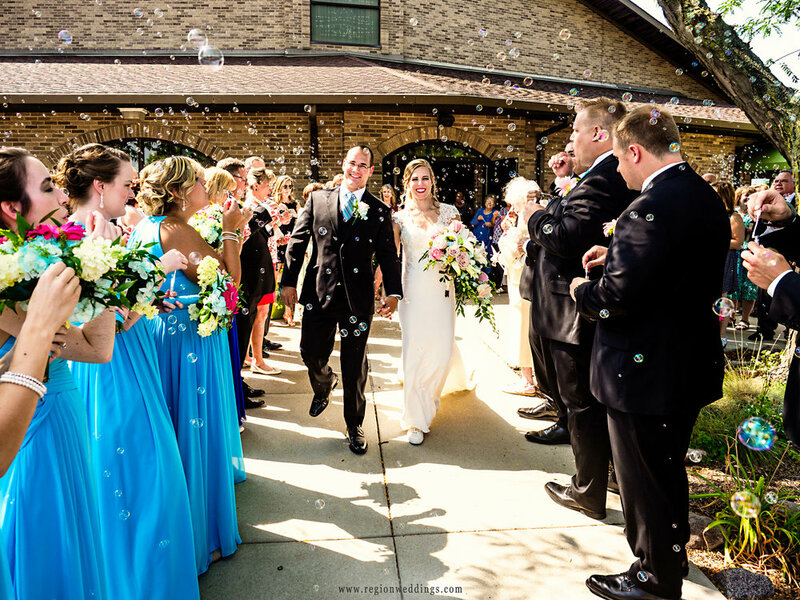 Bubble exit at St. Maria Goretti Church. After the exit we went inside for family pictures and I also took the couple around the church for photos. Kim wanted to show off the stained glass behind the altar and we did just that with them in a classic kiss down below. Then we were off to Centennial Park. Bride and groom at the altar of St. Maria Goretti Church. Stained glass windows overlook the bride and groom for their church wedding photos. Showing off the bride's wonderful dress at church. At Centennial Park, once again I went off with the girls while Bridget photographed the guys. And then we let the girls goof off with Tim and the same with Kim and the guys. 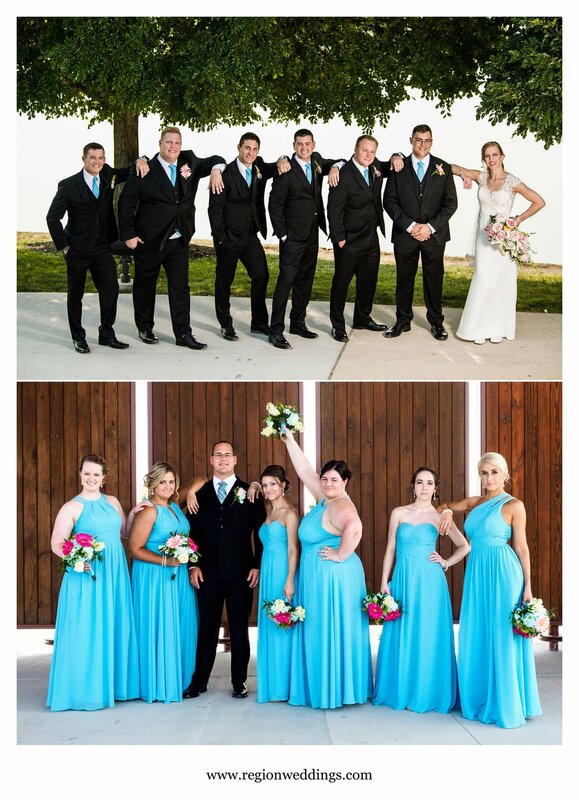 Bridesmaids and groomsmen photos at Centennial Park in Dyer, Indiana. Bride with groomsmen and groom with bridesmaids. Summer wedding photos at Centennial Park. Centennial Park is a popular destination for wedding pictures in Northwest Indiana and we utilized all of the wonderful backgrounds there including the lake and greenery as we walked the perimeter of the park. Bride and groom walk along the greenery at Centennial Park. Bride and groom at the edge of the Centennial lake. It had been awhile since a wedding party had attempted a jumping shot, but Kim and Tim's group were up for it with shoes flying. Soon it would be time to celebrate indoors at the Halls of St. George. Ninja masters and shoe throwers in the summer sun of Centennial Park. The fun continued at the reception at Halls of St. George with intros, speeches and cake cutting. A special appearance was make via cardboard cutout of "a guy named Mike" and then it was time to hit the dance floor. 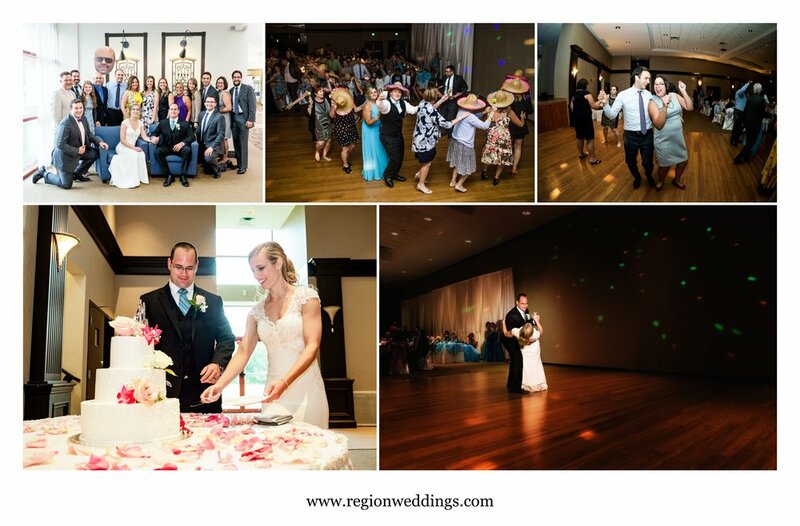 Fun times at Halls of St. George for a summer wedding reception. Dance floor fun at Halls of St. George. It appears the "singing bridesmaids" only know the chorus of the song Africa, but they did a fine job of it!! 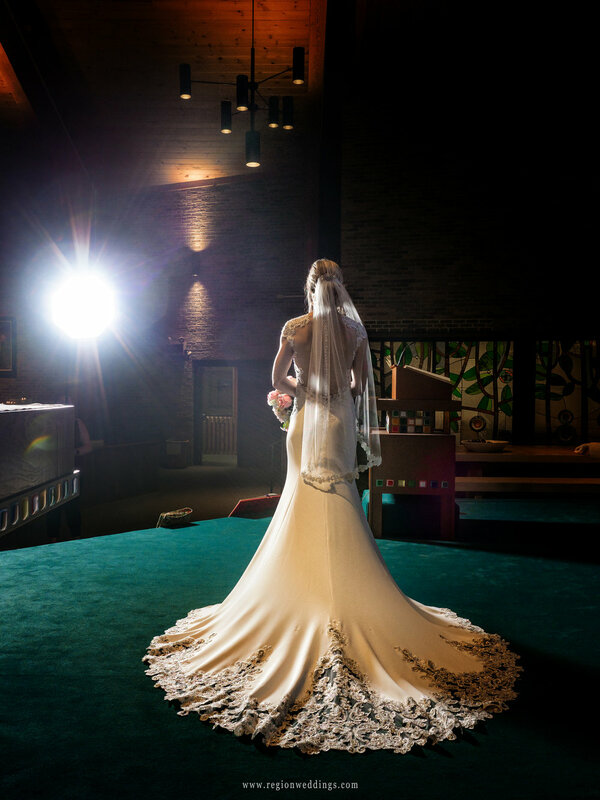 I hope you have enjoyed this sneak peek look at Kim and Tim's summer wedding at St. Maria Goretti Church. Be sure to tune in to the social media channels below for more images. 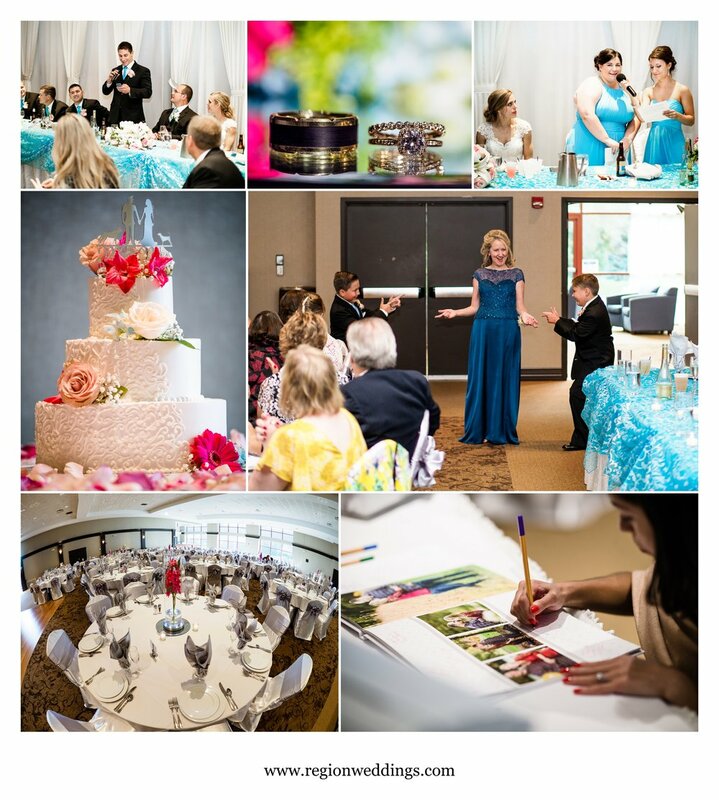 As always, to inquire about wedding photography for your big day, please use the Contact Form to set up a meeting. I'd love to chat with you about your wedding.